Posted: June 21, 2013 2:00 a.m. Updated: June 21, 2013 2:00 a.m.
Scott McGowan shows a model of ZoomR, produced through 3-Dprinting, at Solid Concepts in Valencia. Alyssa Parkinson speaks alongside a Connex500 multi-material 3-D printer at Solid Concepts in Valencia. Scott McGowan describes the stereolithography process as a 3-D printer works at Solid Concepts in Valencia. At first glance, the machine looks like a common office printer, the arm skipping across the surface with a flash of white light. But this equipment does not just print words on paper. Once its task is completed, the machine will have created a physical item. While 3-D printing has just recently gained significant media attention, Solid Concepts, a 3-D printing and rapid prototyping company in Valencia, has been using the technology for more than 20 years. The 3-D printer assembles functioning, usable products, assembling products in a step-by-step, accumulative process. In one example of the technology, a 3-D printer adds layer after layer of material — nylon, flexible and rigid plastic, metal or thermoplastics — as it builds a tangible replica of the original design. From discontinued car parts to medical implants, this computerized 3-D printing technology is the leading manufacturing technique in its industry. The U.S. Defense Department has spent more than $2 million on 3-D printers, supplies and upkeep in the past two years. NASA is also entering the industry, spending $500,000 on 3-D printing in the same time period, according to the Associated Press. Though 3-D printing is a relatively new term, the technology has been around for longer than the company; however, due to a patent that recently expired, it was extremely expensive and not common knowledge to the public. 3-D printing is the term most often associated with the consumer processes, while the term rapid prototyping encompasses the industrial market. “I like to consider rapid prototyping as the commercial side of 3-D printing,” said Scott McGowan, vice president of marketing for Solid Concepts. 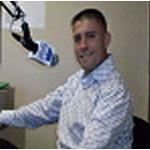 Solid Concepts was founded in 1991 and has grown to be a multimillion dollar manufacturing company, supplying products for the medical manufacturing, industrial design and aerospace component manufacturing industries. At one point, the company produced thousands of customized implants for knee replacements. 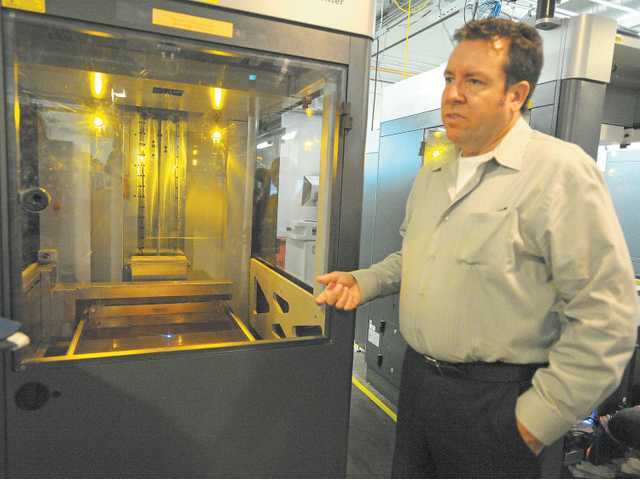 Solid Concepts owns over 162 additive manufacturing machines and employs over 400 people worldwide, McGowan said. Rapid prototyping is being used by many industries, and Solid Concepts has built a bit of everything, he said. On a national level, the industry will grow to produce 3.7 billion dollars worldwide by 2015 and surpass the 6.5 billion dollar mark by 2019, according to Wohlers Associates, a consulting firm for the industry. In the consumer market, a large office supplies company is working to make 3-D printing available to its customers. Announced at the EuroMold 2012 fair in Frankfurt, Germany, the company will bring 3-D printing to its Netherlands and Belgium stores during the first quarter of 2013. Opening the doors of the non-descript Solid Concepts offices, McGowan and Marketing Communications Specialist Alyssa Parkinson led the way into a room full of whirring equipment. 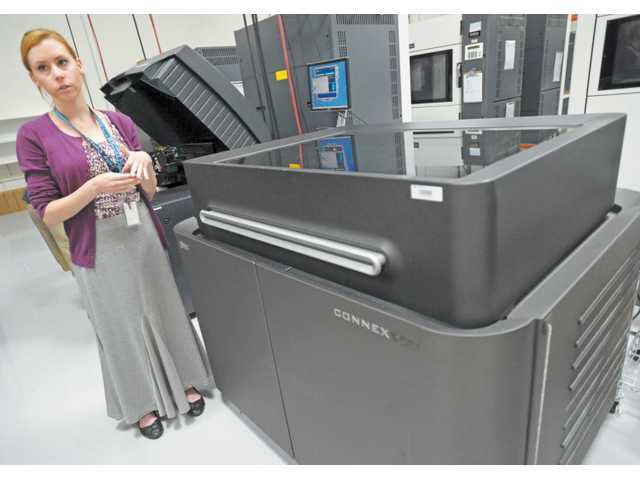 “These are our stereolithography machines,” McGowan said, pointing to a collection of tall, black, rectangular machines with clear windows at waist height. Stereolithography uses an ultraviolet laser to turn liquid into a solid layer, McGowan said. The machines then lower that solid and begin work on the next layer, building a model one layer at a time. Having continued to the main process floor, McGowan pointed to a large white machine filled with white powder. “You can feel the heat,” he said. Similar to the previous machine, the selective laser sintering machine builds layer by layer, but it uses nylon powder instead of liquid polymer. It’s kept at a temperature just below its melting point, McGowan said. A laser, piloted by a computer program and an elaborate series of mirrors, melts only the powder desired to solidify the layer. Motioning toward another model being working by an employee, McGowan said it was about to make a mold for durable yet short-lived parts, like testable show parts and concept parts. 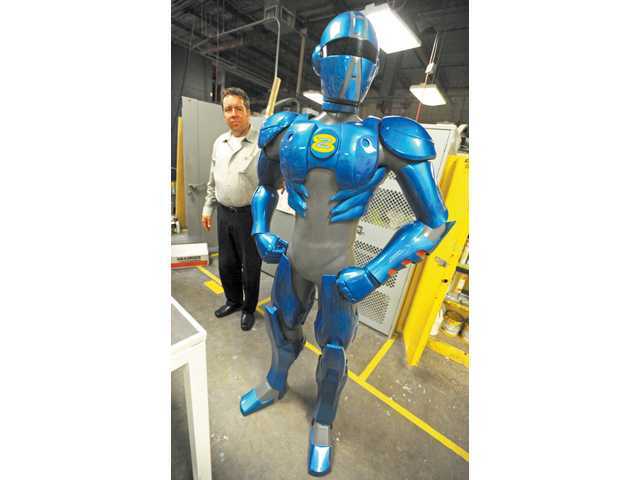 “Is ZoomR here right now?” McGowan asked Parkinson, referring to the life-sized superhero model that the company displays at conventions. Parkinson confirmed that the model was indeed in-house, leading the way to where the black and blue model stood. Easily standing up the superhero, McGowan smiled and said that the model was named ZoomR. ZoomR is the mascot for a Solid Concepts owned website that allows production orders to be made without human intervention. With the ZoomRP.com option, the company offers 3-D printing with the ease of online shopping. More than just a mascot, ZoomR is an example of the innovative ID-Light technology developed by the company. Industrial Design Light uses an intricate scaffolding matrix to create objects that are 1/12 the weight of models made through other manufacturing methods, McGowan said, holding ZoomR with one hand. The matrix serves to ensure shape and rigidity. Walking through to the company’s other building, Parkinson held up a freshly printed L-shaped pipe, created using fused deposition modeling. Fused deposition modeling uses two materials, each deposited by a movable nozzle, she said. The two materials combine to provide support and strength for the new product. “Some people like the feel of the models without finishing,” Parkinson said, holding the rough pipe. Though most models are sanded down and smoothed out, the company also offers hand finishing, cosmetic paints, non-cosmetic paint, metallic plating and inserts. As Parkinson walked across the floor, she approached a large black machine with a window set into the top. Light flashed from inside the window as the arm travelled across partially built parts. Of all Solid Concepts’ machinery, the PolyJet most closely resembles a conventional printer. An arm that sweeps across the surface of the machine to add material follows up with an ultraviolet light to solidify the layer immediately. The machine creates intricate models with precision detail, adding layers as thin as 0.0006 inches — thinner than a sheet of paper. With machines like the PolyJet, ease and customizability have been the driving forces of the industry for the last two decades — one product can be reproduced with minor changes hundreds of times. Producing more than just ZoomR, Solid Concepts focuses on technology that provides a real benefit for the consumer. That focus has allowed the company to thrive, even before 3-D printing claimed its corner of national media attention.